These braised pork chops are super easy to prepare in the skillet. Just brown the onions and chops, add the remaining ingredients, and simmer for about an hour. Orange juice and Cajun seasoning add flavor to the chops along with some vinegar and a small amount of brown sugar. Feel free to use balsamic or white wine vinegar in place of the red wine vinegar. The recipe calls for dry white wine but you may substitute some water or chicken broth if you prefer. In a wide, shallow bowl, combine the flour, seasoned salt or Cajun seasoning, and pepper. Coat the pork chops with the flour mixture. In a large skillet over medium heat, melt the butter with 1 tablespoon of olive oil. Add the onions to the skillet and cook, stirring frequently for about 10 minutes, or until they are lightly browned. Remove the onions to a plate and set aside. Add the remaining tablespoon of olive oil to the skillet. Increase the heat to medium-high and sear the seasoned and floured pork chops, turning to brown both sides, about 3 to 4 minutes on each side. Add the onions back to the skillet. Combine the orange juice, vinegar, and brown sugar; pour over the chops. Bring to a boil; reduce heat, cover the pan, and simmer for 1 hour. 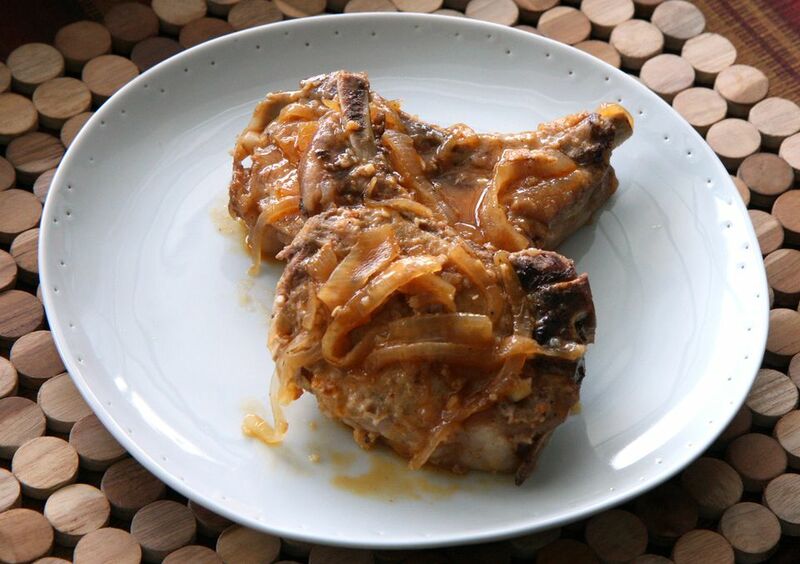 Using a slotted spoon, remove the pork chops and onions to a plate or serving dish and keep warm. Add the wine to the sauce mixture in the skillet and bring to a boil. Cook, stirring occasionally, scraping up any browned bits on the bottom of the pan, for about 4 minutes, or until the sauce is reduced and thickened. Pour the over the pork chops and serve.